Kennel floors have a unique set of needs and they endure more use and abuse than floors in many other settings. With a constant rotation of animals, kennels floors need to be cleaned frequently to provide safe and sanitary conditions for residents. Standard concrete floors and tile floors easily stain, crack, and chip. Worse, these porous floor coatings can actually trap pathogens, potentially creating unhealthy conditions for the animals kept in these spaces. At Prestige Floor Coating, we manufacture industry-leading concrete floor coatings using a unique, proprietary blend designed specifically for East Coast concrete. It is easy to clean, will not stain, and can be customized for any application! Request a consultation for floor coating services for kennels today when you contact us online. Our floor coatings provide superior protection to other products on the market today. Many of the over the counter products are simply epoxy fortified, making them little more than high-strength paint. Our proprietary, multi-layer process, however, provides a high-quality industrial strength floor coating that can make your floors up to 800x stronger than traditional concrete floors. Ask us about the following floor coating services! Whether you need an anti-skid safety coating in the kennels where wet floors are common or beautiful floor coating for your lobby and hallways, we have the product that can fit your needs. With more than 500 colors to choose from and a variety of style and design features, we are confident our floor coatings will meet your needs. To learn more about our coating process, click the links below or see the chart to see how our product stands up against the competition. Prestige Floor Coating has more than 20 years of staff experience in the floor coating industry. With more than two million square feet of floors coating, Prestige Floor Coating is one of the leading floor coating companies serving the Mid-Atlantic region. All of our products come with a lifetime warranty and are guaranteed not to peel under normal use. Unlike many of our competitors who simply buy mass-produced over-the-counter products, Prestige Floor Coating products are designed and manufactured in-house, allowing us to create custom floor coating solutions for your specific design needs and our climate. Our team of installation professionals can finish a typical application in as little as 2-3 days, depending on the size of your facility. We pride ourselves on happy customers, which no one appreciates more than a business owner, and we don’t consider the job complete until you’re thrilled with your veterinary clinic floor. 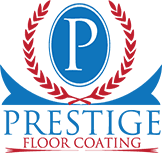 If your kennel floor needs attention, or if you’re opening a new kennel facility and you want quality floor coating, professionally applied, contact Prestige Floor Coating. Our floor coating experts will provide you with an estimate and help you choose the floor coating ideal for your business. At Prestige Floor Coating, we provide flooring coatings for hospitals and other medical facilities throughout areas in Maryland, Northern Virginia, Pennsylvania, Delaware, and Washington, DC.